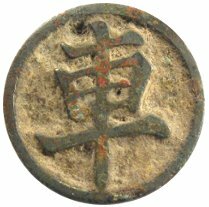 Chinese chess or xiangqi (象棋) is one of the most ancient forms of chess. Old Chinese chess pieces, similar to the “chariot” (車) piece displayed here, were made of bronze and can date back to the Song Dynasty (960-1279 AD). A complete set of these old Chinese chess pieces would be extremely difficult to collect. A modern set of red and black Chinese chess pieces, on the other hand, is usually made of plastic or wood and can be easily purchased. At the left is what a modern set of Chinese chess pieces looks like. This particular set, however, is very special. The “pieces” are actually “mooncakes” (yue bing 月饼) made to resemble Chinese chess pieces. Mooncakes are the traditional pastry eaten during the Mid-Autumn Festival (zhong qiu jie 中秋节) which occurs on the 15th day of the 8th month according to the traditional Chinese calendar. The festival coincides with the autumnal equinox when the moon is at its fullest. This year the festival falls on September 12th. 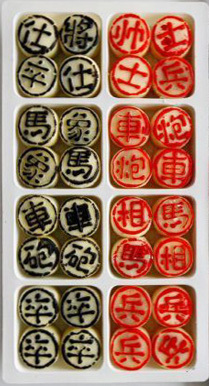 Mooncakes are round and usually have an auspicious Chinese character such as “longevity” (shou 壽) imprinted on top. They have a thin crust with a lotus seed paste filling and, sometimes, have a salted duck’s egg yolk in the center. The mooncake not only symbolizes the full moon but also evokes the story of Chang’e (嫦娥), the beautiful wife of Houyi (后羿), who ate the pill of immortality and as punishment must now live on the moon with only the Jade Rabbit (yu tu 玉兔) as a companion. It is a happy coincidence that this traditional festival food can be made to look exactly like the pieces from the ancient game of Chinese chess. Now during game play, the pieces can be eaten once they are captured by the opposing player. The picture of the Chinese chess mooncakes came from the People’s Daily Online article. I’m sorry but I do not know where you can obtain the mould.